Woodpeckers, chickadees, nuthatches, titmice, & wrens love peanut butter. It's easy to attract them to this feeder. Just spread the peanut butter in the holes and sprinkle some seed, Mealie Snax, or Wax Snax over it. This will provide a nutrious and high protein treat for the birds. 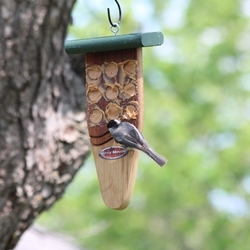 This feeder is made by hand individually from very fine craftsman.